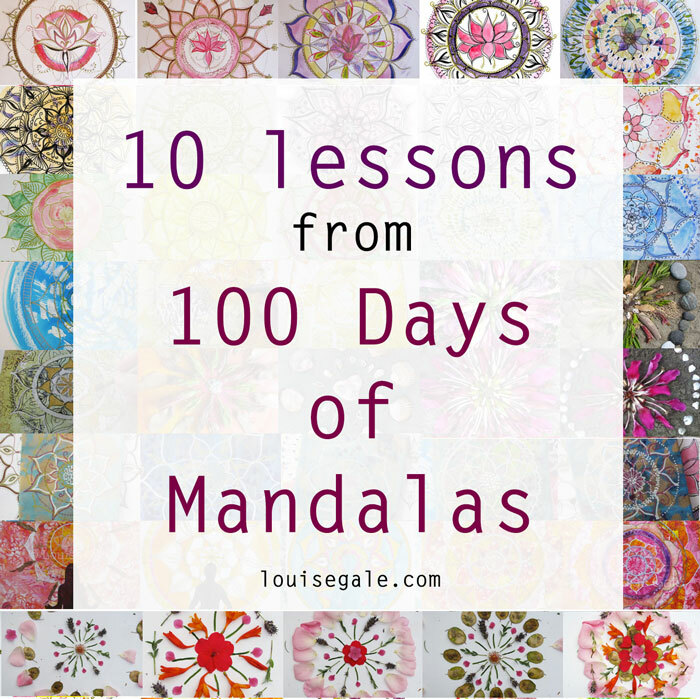 When I embarked on the 100 Days of Mandalas, I had no idea of the journey ahead. We were in the final week of my online class “Mixed Media Mandalas” and one of my lovely participants Rosalina Bojadschijew decided she wanted to continue her mandala journey and do 100 days of mandalas as part of the 100 day project. So I decided to join her! What can you do with 100 days of making? When I looked further into #the100daysproject I discovered that the project was a celebration of process that encourages everyone to participate in 100 days of making. They state that “The great surrender is the process; showing up day after day is the goal. For the 100-Day Project, it’s not about the finished products—it’s about the process.” I love this, as art is so much about what happens to us in the process of making it, and focusing on something we love or are interested in for 100 days will certainly promote a positive change. I completed my 100 mandalas in August and although I had to skip about 7 days when I went to the UK, it was a daily practice that really struck a deep and meaningful chord for me. So I thought I would share some insights and things I learnt from taking this “challenge”. If you are currently working on a project or thinking about taking on such a project, I hope these 10 lessons learnt help you or inspire you. AND I would love to hear your thoughts or ideas for what you could do in your 100 days. 1. Cultivating a daily creative practice feeds your soul Like many of us, juggling a busy life can sometimes mean we are not in the desired ‘place’ to be creative and often without a focus on a particular project or theme, it might be more of a challenge to decide ‘what’ to paint or draw. Dedicating time to be creative really does feed the soul. It really helped me re-connect to how important it is to make more time to be offline and create. When I am working on other projects for clients or a website design project, eventhough I am being creative, it is not the same as being offline working on a piece of artwork and connecting to the creative muse inside. 2. It is okay to fall off the ‘daily wagon’ Lets face it, 🙂 life happens, so when you are traveling or something pops up that takes priority, it is ‘okay’ to fall off the ‘daily wagon’. When I went to see family and friends in the UK, I felt guilty if I missed a day on my mandala project, and quickly realised this is not how I wanted to feel. So I needed to take a little break and although I did not create a daily mandala during that time as part of the project, I found a way to introduce something creative into my day whilst I was out and about, such as take photographs or really look around me for inspiring patterns and colors. I didn’t want to have the feeling of “I have to” create a mandala (because I have committed to this 100 day project!) 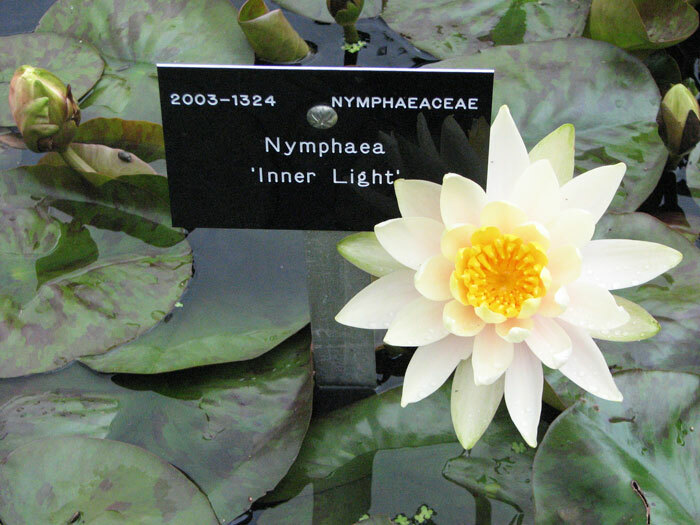 Below is a photo I took of a beautiful lilly (a natural mandala) at the Royal Botanical Gardens at Kew when my mum and I spent a day there together. When committing to such a project, it is easy to let the mind wander to the future – “what will I create on day 50” for example? “Can I really do 100 of these?” The little voice in your head may start to chatter on! Coming back to your practice of simple being creative will bring you back to the present moment where the joy is in the journey itself and as in lesson No2, I was okay with taking a break because something else took priority that day. You never know what opportunities may arise or present themselves when you commit to creating something for 100 days. For me, it really helped me communicate how much I love mandalas and how simple or detailed they can be and that they are all around us. It enabled others to see that they too can create mandalas and so I decided to run a special summer session of my Mixed Media Mandala class where I met many new artists and creators. I also received an invitation from a leading UK magazine to write an article about mandalas and include mandala work in their artist feature (coming out later in 2015) During this project, I also received a beautiful copy of ‘Painted Blossoms’ by Carrie Schmitt where I have a mandala interview feature. 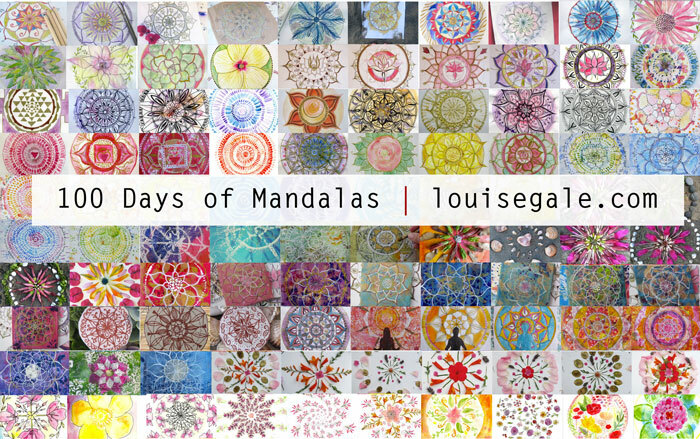 When I began the 100 days of mandalas, a few other lovely friends on instagram (some who have taken my mandala class, some who have not) decided to join in, so it was a great way to connect to a wider community through this project. It really opened up my connections on Instgram where I also discovered other mandala artists to share with. 6. Posting more often on social media was fun! Before this project, I was a little sporadic in posting to my Facebook page and Instagram so it was wonderful to post daily and sometimes more than once a day on the progress of this project. This resulted in more lovely followers and also more conversations and connections. I also explored the use of hashtags more and went to the #the100dayproject page and #100daysofmandalas to see who I could follow and connect with. The art of creating also comes with the art of letting go. Letting go of expectations and what the final piece would look like. When you are creating a 100 of anything, there are going to be some that you like more than others, so accepting that can free up so much energy. To keep an element of play and detachment is key, so I try to keep this in mind as much as possible. Knowing the art will be shared as part of the project can feel a little intimidating. So I learnt to let go of worrying about this and that it is okay if you feel that one piece of artwork is not as good as the others, so post it up anyway! 8. As creative beings, we are constantly growing and re-adjusting. It is so easy to get caught up with other projects with my lovely clients and take on more work, but I think the key thing this project has taught me is that rather than take on too many new projects, to choose to spend more time offline in my studio creating. So with that said, I am limiting any new projects I am taking on for 2016 so I can focus on the lovely people I currently work with and grow my own portfolio and creative practice more and more. A good reminder I seem to need a nudge with every year! Not only has this project taught me about cultivating a daily practice and staying the journey, it has also helped me think about how I want to spend me time and what I would like to focus on next creatively. During this project, I found myself creating mandalas with watercolors. I dug out my old Winsor and Newton Cotman watercolor set, bought some student level paints and it opened up a new passion to explore this medium. So exploring the beautiful medium that is watercolor is my next project! Last but not least, I wanted to celebrate that this project wasn’t totally focused on the end results but about celebrating process and the creative practice. It was also about simply showing up each day, posting my work on Instagram and Facebook and sharing my creations and journey with friends. Thank you to all who supported me during this project, commented on my work, asked questions and joined in. I hope it has inspired you to start or continue with your own creative projects and I look forward to another creative project sometime soon. Have you started or completed a big creative project recently? Would love to hear about it and any lessons or insight you have. You are an inspiration, Louise. You made many very beautiful mandalas. In fact, I’m so inspired, I’m going to commit to something. I’m going to Maui for two months. I’m going to try to post either a sunrise or sunset every day I am there. What a beautiful idea you have had. I have been drawn to mandalas for a while now and am so thankful to have found your site. Your mandalas are positively enchanting! And the lessons and insights you share transcend the art of drawing. I am not an artist but I have always wanted to learn how to create these magical mandalas. They are so spiritual in nature. I am going to commit to doing something for 100 days which for me is quite a commitment as I lack discipline and follow through. I’m much like a butterfly that lights only briefly upon a topic before its off again. This can really be a game-changer for me. Thank you! Hi Chi, so wonderful you are here, thanks for visiting. Thank you so much for your kind comments and so glad you like mandalas. I hope the free mandala class will help you create some mandalas of your own. I completely understand as I can be one of the butterflies myself! This is why this project was so good to commit to. There are always so many other ‘shiny things’ going on and other art projects to work on. What this has taught me is to stay with one for a consistent time as beautiful things can happen. wowwww 100 types of faces sounds so so interesting:):) Thank you Louise ..